As climate change makes crop diversity even more important, gene banks struggle to stay afloat. May 21, 2015 — During the past few years of civil war in Syria, rebel fighters have destroyed Shia mosques and Christian graves, and burned and looted Christian churches while the Islamic State group has demolished priceless artifacts in the region. Nothing seemed sacred to the disparate groups vying for control of the region. Yet, so far, a store of ancient seeds has been left alone. In 2012 rebel fighters seized control of the International Center for Agricultural Research in Dry Areas, a research field station and gene bank about 20 miles (32 km) south of war-torn Aleppo that maintains a unique collection of 150,000 different populations of wheat, barley, lentil and faba bean seeds from 128 countries. ICARDA is just one of the hundreds of institutional crop collections, or crop gene banks, around the world that meticulously preserve samples of distinct crop populations and their wild relatives, even creating duplicates for storage elsewhere, so that this vast genetic diversity is not lost. Seeds are the easiest samples to store, and remarkably, the rebels have allowed five remaining ICARDA staff, all Syrians, to maintain that country’s seed collection. Before the situation in Syria deteriorated in early 2012, ICARDA staff members diligently duplicated 26,000 accessions that had not yet been safely stored outside Syria and transferred them to Turkey and Lebanon. Since 2012, they’ve continued to secure duplicate samples at the Svalbard Global Seed Vault in Norway and other locations outside Syria, and now plan to reconstruct the collection in Morocco so they can continue to distribute seeds. Their efforts garnered them the Gregor Mendel Innovation Prize, which recognizes contributions to plant breeding, in March 2015. The Svalbard seed bank, a so-called “doomsday vault” inside a permafrost-encased Norwegian mountain, serves as a global backup for the world’s seed collections. Photo by Cary Fowler/Global Crop Diversity Trust. It’s not clear why the Syrian fighters have left ICARDA’s gene bank alone. It could be due to ICARDA’s prestige in the Fertile Crescent, where farming began more than 10,000 years ago, or it could be that the staff convinced the fighters of its importance. “Even if the story ends badly, something special is going on at ICARDA,” says Cary Fowler, former executive director of the Global Crop Diversity Trust, the Bonn, Germany–based international body with the mission of safeguarding crop diversity forever. The world’s gene banks hold bounties of diversity created by farmer-assisted evolution. They are literally priceless: There’s no real way to quantify their worth. The only thing that is clear is that their work in maintaining the flow of these genetic resources from one country to another is vital to food security. And their importance is growing in the face of climate change: Inside these national and international collections lie seeds that almost certainly contain traits that will help future crops withstand disease or prolonged drought. ICARDA is one of about 1,750 individual gene banks around the world that collect, store, regenerate and distribute crop varieties and their ancestors in perpetuity. To date there are 7.4 million accessions in gene banks around the world; roughly 25 percent of those are unique, while the rest are duplicates. If these collections aren’t maintained, they risk being lost forever. Yet, despite their importance to a food-secure future, gene banks suffer myriad challenges, one of which — a lack of secure funding — is manmade, widespread and perennial. Most countries fund some type of bank of their crop diversity. As well, the global consortium known as CGIAR oversees 11 regional collections. 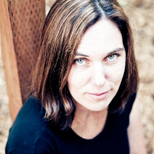 “I can’t name a single gene bank that operates on a secure, multiyear budget,” says Fowler. Yet, to secure genetic diversity, gene banks must maintain, regenerate, characterize and distribute their contents to interested breeders on a year-to-year basis at the mercy of various government budgetary whims. The result? Without consistent long-term funding, gene banks limp along, operating under a crisis-management approach just to maintain the viability of the conserved germplasm, says Paula Bramel, deputy executive director of the Global Crop Diversity Trust. To stem the neglect resulting from funding shortages worldwide, the Global Crop Diversity Trust will, in April 2016, kick off a drive to raise the first US$500 million of what it ultimately hopes is a US$850 million endowment from governments, foundations, nonprofits and industry. For the price set aside in this year’s U.S. federal budget to refuel and renovate the USS George Washington, a U.S. Navy nuclear-powered aircraft carrier, the trust could safeguard the world’s collective crop future. Without this money, valuable traits that could protect crops in a changing climate could be relegated to the pages of history. The lack of funding — although the most pressing — is hardly the only threat facing gene banks. Historically, gene banks have not fared well in areas of civil unrest, for example, which makes what’s happening in Syria so unusual. In fact, ICARDA’s headquarters exist in Syria because civil war broke out in Lebanon, the location originally planned in 1977. Gene bank collections have been lost or destroyed due to conflicts in Afghanistan, Burundi, Rwanda and the Solomon Islands. Gene banks face a host of other threats as well. When gene banks flooded in Thailand in 2011, some of the unique 20,000 rice accessions held there were lost forever. The Philippines’ national gene bank recovered from flooding damage in 2006, only to be destroyed by fire in 2012. “Tropical storms are a concern throughout the Pacific; climate change is a reality,” says Valerie Saena Tuia, coordinator of genetic resources at the Center for Pacific Crops and Trees, or CePaCT, near Suva, Fiji. Urban encroachment threatens other collections, particularly for the many crops that cannot be stored as seed, such as cacao or coconut, and can only be conserved as live trees in the field. Worldwide, coconut collections face threats from pests, climate change, environmental degradation, natural disasters and urbanization. The discovery of a devastating disease near the International Coconut Genebank for the South Pacific prompted a decision in 2013 to relocate the gene bank from Murunas to Punipuni, Papua New Guinea. “At any given time there is almost always something bad going on in one of the gene banks around the world,” says Fowler. 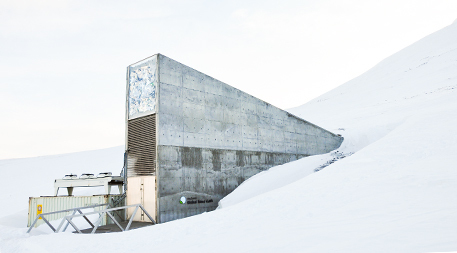 This vulnerability inspired Fowler to champion the creation of the Svalbard seed bank, a so-called “doomsday vault” inside a permafrost-encased Norwegian mountain, to serve as a global backup for the world’s seed collections. But unlike ICARDA and other gene banks, Svalbard is simply an icebound warehouse, not a working entity able to contribute genetic diversity to global breeding efforts. Still, preservation efforts like those at Svalbard are the first step in maintaining the diversity within stored accessions. “No country has enough diversity to be self sufficient,” says Luis Salazar, communications manager at the Global Crop Diversity Trust. For that reason, more than a decade ago countries set forth guidelines through the International Treaty for Plant Genetic Resources for Food and Agriculture, the so-called International Seed Treaty, to create a multilateral system of sharing access to seeds. “Since the Treaty for Plant Genetic Resources for Food and Agriculture … 135 countries have agreed that we live in an interdependent world,” Salazar says. Yet few gene banks meet international standards, set by FAO in 2014, for long-term conservation. Fowler led the first assessment of the state of the world’s plant genetic resources commissioned by FAO in 1996. The gene bank managers who responded said they needed to regenerate 50 to 100 percent of their collections. Over time and depending on storage conditions, seed viability can decrease, so gene banks need to regrow the plants to produce fresh seed so they have good viability. The fact that so many need to do this for such a large percentage of their collections was an ominous sign — one that indicated poor storage, poor management and ultimately genetic erosion, says Fowler. The second assessment, published in 2010 by the Food and Agriculture Organization of the United Nations, noted that the backlogs of seeds in need of regeneration persist in 37 percent of surveyed gene banks and increased in 18 percent of them. 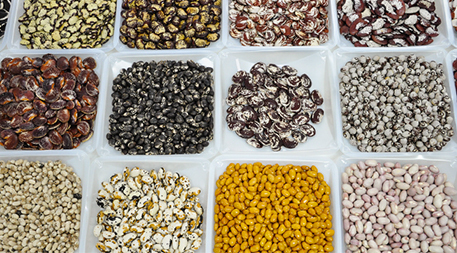 Under proper cold storage conditions, seeds should remain viable for 100 years. They must be regenerated more often to maintain viability if those conditions aren’t met — but at a cost. When seeds are taken out of storage and grown in order to produce fresh new seed, it is difficult for the original sample to be reconstituted exactly as it was, says Fowler. A maize seed sample collected in Malawi and later regenerated in Ames, Iowa, for example, will likely result in a different sample — one in which gene expression can differ considerably, perhaps even losing some diversity, he says. In developing countries, where many of the most valuable collections reside, facilities lack state-of-the-art equipment, and electricity is expensive. India’s National Bureau of Plant Genetic Resources relies on electricity-based storage of seeds at –64 °F (–53 °C). Given the expense, it is exploring storage methods that rely on liquid nitrogen and could cost less. Preserving the material is only half the battle, though. “The first priority is simply to keep the material viable, then, labor permitting, we want to characterize the material — linking physical traits to genes,” says Axel Diederichsen, curator of Plant Gene Resources of Canada in Saskatoon. Characterizing each sample — which means growing and evaluating the sample to identify traits of interest, such as those that could be useful in climate change adaptation planning — is an important step as demand for gene-banked material from crop breeders and researchers eager to tap into different collections in search of traits is skyrocketing. Despite the importance of the diversity held within, global crop gene banks are often underfunded and face other threats. Photo by Cary Fowler/Global Crop Diversity Trust. Yet thoroughly characterizing each sample’s traits takes time and resources, and is often the bottleneck in being able to identify the traits of interest in seeds and get them into crop breeders’ hands. For some crops, to develop a new variety could require selecting from 100 to 150 different gene bank samples (which amount on average to 1 to 5 percent of the preserved diversity for a given crop), says Nikolai Dzyubenko, director of the Vavilov Institute of Plant Industry in St. Petersburg — named after Nikolai Vavilov, a plant geneticist who amassed the world’s largest collection of plant seeds in then–Leningrad, Russia, in the 1920s and championed the collection of genetic diversity to be used, not simply conserved. For highly complex breeding tasks, Dzyubenko adds, the crop genetic diversity at researchers’ disposal may be insufficient, so they have to approach other gene banks around the world seeking additional material. “There is an urgency now, with climate change, to characterize crop varieties and wild relatives and involve breeders to develop varieties,” says Linda Collette, secretary of the FAO Commission on Genetic Resources for Food and Agriculture, which in January issued voluntary guidelines encouraging countries to study, preserve and utilize genetic resources in adaptation planning. Despite that urgency, “in the U.S., we have limited resources to do field and greenhouse evaluation of our collections to identify useful traits,” says Stephanie Greene, curator at the National Center for Genetic Resources Preservation in Ft. Collins, Colo. But gene banks are arguably at a turning point. An international consortium of gene banks, academics and industry recently launched an effort, dubbed DivSeek, to systematically link genes and traits of seeds. As well, the Global Crop Diversity Trust is hosting a budding centralized database of gene bank inventories, called Genesys, which will enable researchers to mine collections in ways that have never been accessible before. “Although most gene banks were created in the 1970s, the context in which they operate today is remarkably different,” says Fowler. Climate change, he says in the new documentary “Seeds of Time,” which chronicles his journey to get Svalbard built, is the single greatest challenge agriculture has ever faced. In a changing climate, gene banks will be more relevant than ever before. The ability to mine existing diversity is crucial to breed seeds for the future. “It’s not how gene banks will hang on and continue to turn on their freezers, but how they will make themselves functionally useful,” Fowler says. But that typically means doing more with the same — or less — funding even as demand increases. Greene says the National Plant Germplasm System, an effort by public and private organizations in the U.S. that houses 560,000 samples — up from 450,000 in 2000 — filled 250,000 requests for seeds in 2013, up from 175,000 requests in 2000. The budget, however, is slowly eroding, down to US$40 million from a high of US$45 million in 2003. Conserving and using material in a gene bank has an extremely high cost-benefit ratio. A 2014 study assumed that at some point in the next 100 years, an adverse event will disrupt production of seven staple crops in Greece. It then estimated the value of the genetic resources, maintained by the Greek Gene Bank, able to salvage lost crop productivity. It found that the Greek Gene Bank’s current operating costs were less than 3 percent of the US$3 million value it generates in the form of annual crop insurance against potential lost yields. Our hope is to preserve thèse crop gene banks ,for the humanity benefit.we pray for it. This is kalidasan from india. Am grower and supplier of exotic vegetables and herbs. Am looking romanisco broccoli and kaffir lime seeds please.